This week: Flamingods at the Sunflower Lounge. 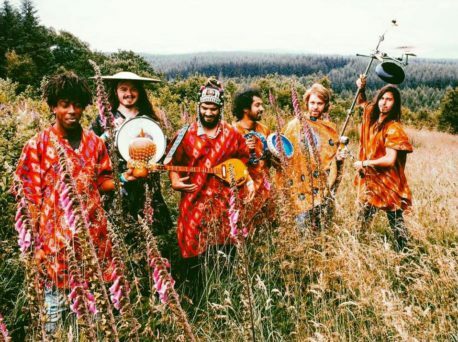 We guarantee you’ve never seen or heard a band quite like Flamingods. The unique Bahraini boys have a well earned reputation as multi instrumentalists combining instruments that have never been heard together before in a dizzying array of genres. Not content to just master the conventional style of playing the instruments accumulated on their travels they will beat, batter and abuse them until the ‘right’ sounds are emitted. New album ‘Majesty’ has been critically acclaimed in all quarters and continues the exotic globe trotting sonic adventures that were established on Hyperborea with a more psychedelic tinge. Our advice? Close your eyes, cue the track ‘Majestic Fruit’ and let the lazily beautiful sounds of Flamingods stroke your soul. Local psych merchants Handwaxx provide groovy support. New album ‘Majesty’ out now via Soundway Records: https://lnk.to/flamingodsmajesty The concept for the Rhama music video revolves around a mysterious society of Pakistani wrestlers that are present in Dubai. Dedicating their lives to a traditional form of wrestling called Kushti, their matches take place every Friday during sunset in a sandy lot of land in old Dubai.